10-Strike Network Diagram 2.5 Free Download - Create network maps with this powerful network diagrammer. Draw a LAN topology. 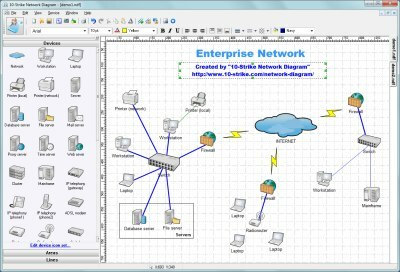 10-Strike Network Diagram is a powerful network diagrammer and mapper for the quick creation of visual local-area network maps and diagrams and saving it as Microsoft Visio charts, vector or raster images. The application scans a local area network via the ICMP, TCP, and SNMP protocols, automatically builds a graphical network map, displays devices of different types as special icons, and draws links between them. The cornerstone of the application is a convenient, feature-rich graphic editor and an object library; a wide range of network device icons, &quot;stretching&quot; lines and areas of different forms. In addition, the software offers a wide choice of colors, fonts, and fillings for graphic primitives. All these means can make your network maps and diagrams better-looking. Statement: First, please download the orginal installation package by clicking the download link. Of course you may also download it from the publisher's website. Using 10-Strike Network Diagram crack, key, patch, serial number, registration code, keygen is illegal. The download file hosted at publisher website. We do not provide any download link points to Rapidshare, Hotfile, Depositfiles, Mediafire, Filefactory, etc. or obtained from file sharing programs such as Limewire, Kazaa, Imesh, Ares, BearShare, BitTorrent, WinMX etc. Software piracy is theft. If you like 10-Strike Network Diagram please buy it.